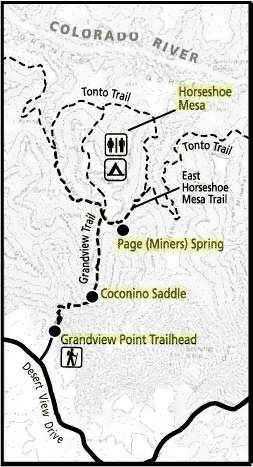 Grandview Trail (South Rim) Very Steep) The Grandview trail offers hikes to Coconino saddle, 2 miles (round trip), and Horseshoe Mesa, 6.4 miles (round trip). Trail conditions are tougher than the Bright Angel and South Kaibab trails. Unmaintained steep trail requires caution. Begins on canyon side of retaining wall at Grandview Point on Desert View Drive (12 miles east of village). For experienced desert hikers. Hiking boots recommended. Very steep, rocky, and strenuous. Unmaintained trail. Some shade on trail, varies on time of day. By vehicle to Grandview Point, 12 miles east of village along Desert View Drive. Trail begins on canyon side of retaining wall at Grandview Point. NO water along trail. Day hiking as far as Horseshoe Mesa is not recommended during summer.